In my last post I mentioned that, based on the visits to my blog posts, Quizzes in Captivate seem to be one of the stumbling blocks for newbies. Most of the quizzing blog posts with focus on default quiz slides are already pretty old. More recently I have been talking about new features like Branch aware and Knowledge Check Slides. The most visited post on my blog will be updated in a near future, to accommodate recent changes in Captivate. 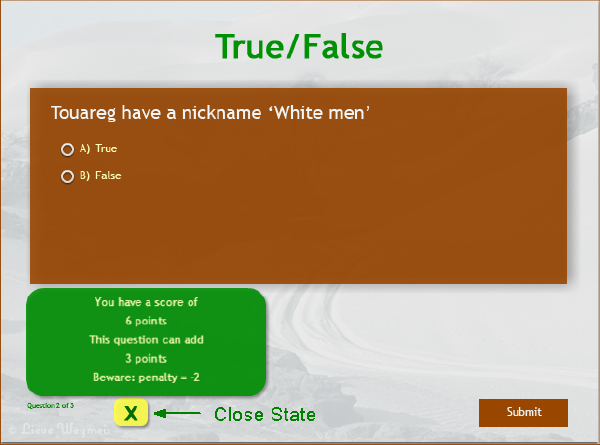 The present article will offer you some ideas about using the Quizzing category of system variables. If you ever downloaded my full list of system variables, you know that these variables are read-only, at least if you are not a JS expert. As a bonus to reading this post, you’ll find a downloadable list with Quizzing System variables including some personal comments and links to blog posts where I have used those variables. This article is meant as an introduction to the use of variables. For that reason the mentioned use cases are not complicated. This use case has been explained more in detail in an older article (Buttons on question/score slide). In this example I ‘refurbished’ that older version using newer features multistate object, shared action, toggle command. This text container can be permanently on the question slides, always available, or you can use a Toggle shape button to trigger its appearance. That button is visible in the screenshot as a green button with the label ‘i’. 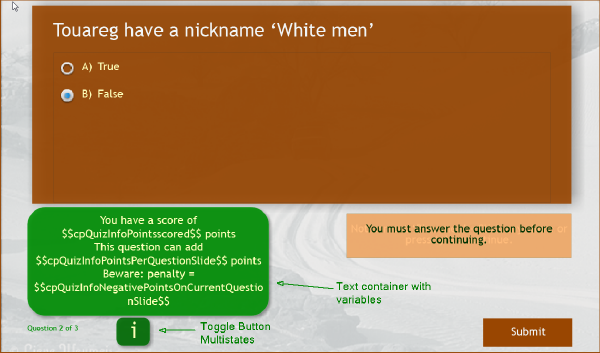 Similar to the text container, it is also inserted on the first question slide, timed for the rest of the project. This shape button has an extra custom state ‘Close’, visible on the next screenshot, to turn it into a real toggle button. The action used for this shape button is the shared action described in ‘1 action = 5 toggle buttons‘, and a user variable v_visib is used in that action. When importing or dragging the shared action from the external Library with shared actions, that variable is created automatically (see Reuse Shared Actions in Other Projects). To be sure that the information is closed by default On Enter for each question slide, I use an On Enter action for each question slide (see use case 3). 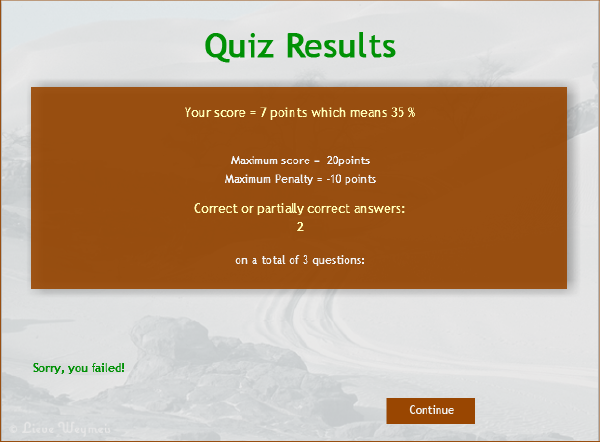 You see again several embedded quizzing system variables: cpQuizInfoPointsscored, cpInfoPercentage, cpQuizInfoTotalQuizPoints, cpQuizInfoTotalCorrectAnswers and cpQuizInfoTotalQuestionsPerProject. Moreover there is one user variable, v_penalty, which I’ll explain in use case 3. 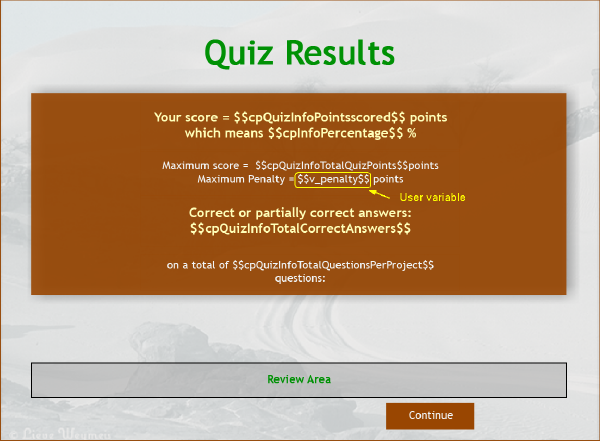 Although there is a system variable (with a very long name) cpQuizInfoNegativePointsOnCurrentQuestionSlide, no exposed system variable is available containing the total penalty of the quiz, which is the opposite of the maximum number of points , cpQuizInfoTotalQuizPoints. If the user misses all answers, he’ll get a negative score equal to that Total penalty. I will have to calculate that total. 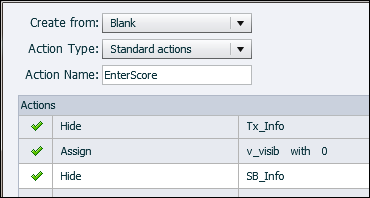 The first 3 commands take care of resetting the toggle button (SB_Info with the variable v_visib ) and hiding the text information container (Tx_Info). The Expression command is using cpQuizInfoNegativePointsOnCurrentQuestionSlide to calculate the present amount of v_penalty. It may seem confusing that I’m using ‘+’ as math operator: reason is that the system variable always shows a negative number. You don’t have to believe me: have a look at the second screenshot in use case 1. I’m waiting for your comments. Do you see ways of using those system variables in your projects? Do you have questions, use cases that you cannot figure out if they are possible? Fire away. 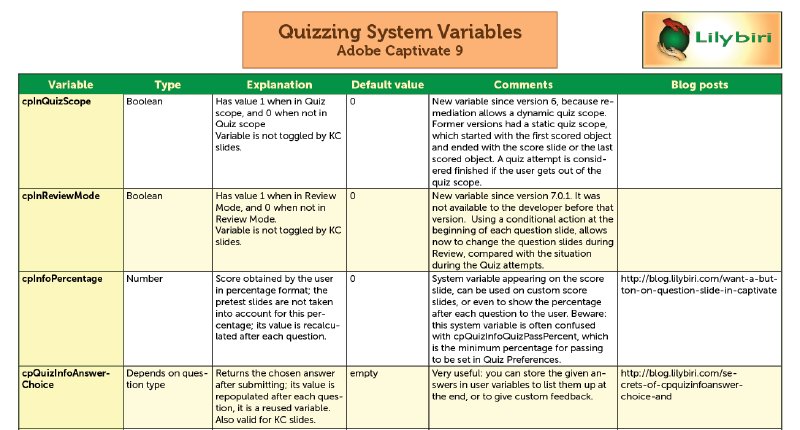 Thanks for providing the awesome spreadsheet re: Quiz system variables. It quickly answered a pressing question on my current project. You’re welcome. The full explanatory table with all system variables can also be downloaded from one of my blog posts and much more tables like events, commands…. So much is lacking in the official Help documentation.